Special Olympics 50th Anniversary Celebration with Chance The Rapper with Usher, Smokey Robinson, O.A.R., Jason Mraz, Francis And The Lights, Daya, and more. Join Chance the Rapper, Usher, Francis & The Lights, Daya, Smokey Robinson, Jason Mraz, and O.A.R. on July 21 at the 50th Anniversary Celebration Concert! 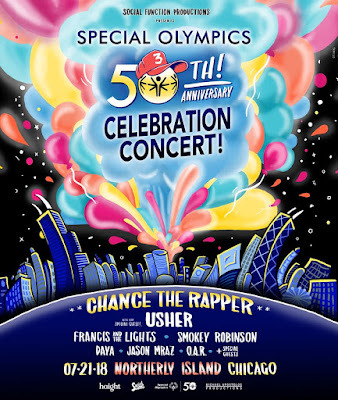 Chance the Rapper’s production company, Social Function Productions, and Special Olympics have partnered to produce the 50th Anniversary Celebration Concert featuring Chance the Rapper, Usher, Francis & The Lights, Daya, Smokey Robinson, Jason Mraz, and O.A.R.! Dedicated to empowerment and inclusion, the concert will inspire an #InclusionRevolution. After 50 years, Special Olympics is calling for people all over the world to join together in a celebration of inclusion, justice, joy, and most of all unity. The times demand unity. The urgency cannot be overstated. The possibilities are real. The time is now. Come out for the Special Olympics 50th Anniversary Celebration in Chicago 17-21 July! Join us as we launch into the next 50 years of the Inclusion Revolution with a week of high-level sports competition at the Unified Cup, family-friendly fun at the Torch Run and Global Day of Inclusion festival, and a star-studded concert at Northerly Island. Learn more below! Chance the Rapper announced the Special Olympics 50th Anniversary Celebration on June 25 on Twitter @chancetherapper.